The last few days have been filled with awesome. First practice was last night. The girls . . . . are freaking awesome. They are all in 8th grade. Peanut = 6th grade. So I love that! Emz to team: what should we call our team? Team replies: "runners" [ya, seriously, no joke - so they were referring to "road" runners, I substitute "TM" runners] I about cried, I was so happy. Peanut noticed and pinched me. Happy first day of fall to all of you who actually experience "fall". It's freaking 106* here today. Yes, Matty-O, I am whining. Received this from the one and only "IMRon". The Peanut and I are stoked. This weekend ----- something big happens in our home. ok sorry, just had to get that off my chest. Drives me crazy when people misspell that word. All. smiles. I am [finally] seeing results from this new method of training and I could NOT be happier. Hoping the 20 miler on the books for tomorrow goes just as well. Received this hand-out at a parents meeting at Peanut's school last night. This freaking cracked me up. Walked in from above mentioned meeting to hear the Pita say, "awww, watch out" and see him trying to teach the Peanut how to do the running-man. I interjected immediately as this is clearly MY area of expertise. So. Happy. Freaking. Friday. Everyone!! Now, please . . . . .
you are FREaking awesome. and i mean that A LOT. (trying to make up for spaces not used by other less intelligent humanoids). the corn maze (maize maze?) is now my wallpaper. and if you stop by Costco (on the off chance) please pick up a lot of stuff. 1. New running shoes. I finally got a pair that have bright colors and I'm stoked! 2. I spent at least two afternoons cooking lunch while dancing around the kitchen to John Mayer. There's something about his music that just makes me happy. 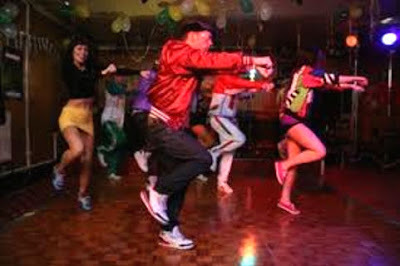 ...or maybe it's the endorphins from dancing. Either way! 3. I got called into work yesterday. Not always fun, I know, but that gave me today off and I already had Saturday off. I don't often get two days off in a row!! NO speedos!!! No banana hammocks people!!! Congrats on the coaching position lucky girls!!! I also get irritated with the use of "irregardless" It.is.not.a.word!!!!!! 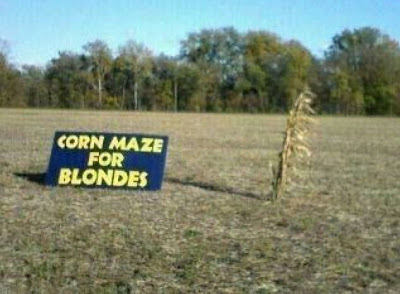 LOVE the Corn Maze for Blondes Pic - I was given that by a friend too. Aren't friends awesome? 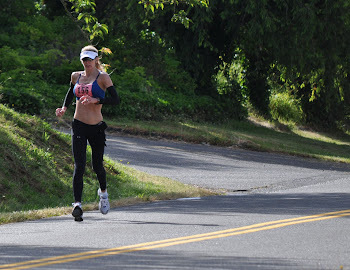 I ran a KILLER awesome run yesterday 4 (you read that right FOUR) days post marathon (must be the 4). I'm glad I'm not the only one that gets frustrated when people misspell a lot...or their/there/they're...or congraDulations. I can barely type that without changing it. Way to go on the coach thing. That's awesome. So is the 16.27 mile run today with 20 more tomorrow. You're incredible. Keep it up! 3. New pair of shoes. "Corn Maze for Blondes" almost gave me snot noodles! as if the ENTIRE Planet doesn't already know ...BUT I passed 50 days and 4000 miles on my running streak! yesterday I tried something new and ran to the gym, and then worked out for an hour. I'm starting to like this whole running as a form of transportation thing... too bad most of the roads here are way too scary to run on. hell, most of them are terrifying to drive on! Pretty awesome week for you. It's Sunday night and I can't remember what happened last week now. But I'm hopin' for a rockin' week this week. 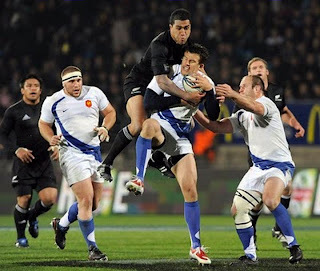 And hoping Tonga kicks France's derriere this week. Chahoo! THANK YOU for the "a lot" rant! !